God communicates His grace in manifold ways. I am in the midst of re-reading Your God is Too Safe, by Mark Buchanan. In Eugene Peterson’s foreword to the book, he says: “An accurate understanding of the formation of the Christian life requires three things: stories well told, Scripture sharply imagined, and language skillfully used.” He goes on to briefly unpack what he means. Now, let me say from the start that I do not think for one minute that Eugene Peterson believes that those three constitute what we need for a complete understanding of the formation of the Christian life. They are, however three of the most important components that provide for that understanding. I love words and the use of language. I especially love the use of language in the Scriptures. One of the reasons is that the Scriptures present me with the challenge and joy of beholding and participating in the Mysterious power of the Holy Spirit at work (the use of the “M” is intentional and should alert you to the idea of “sacramental”) in and through the spoken and written language and its translation from one tongue to another for the purpose of effective communication. I recommend it to you. I can be soon be found here. What was the wisdom of such a practice? As I go about the activities of my day if find myself slipping into a spirit of forgetfulness. When I am in this “mode,” temptations, distractions from the path of Christ assail me. Of course, since I am “asleep to Christ,” I am unaware of the true nature of them. It is too easy to end up in this dangerous place as I move through the day. I need to stay in an attitude of remembrance and awareness of the presence of Christ and the grace of the Holy Spirit in the present moment. St. Dimitri has become an example to me. I need to deliberately and formally come to a complete halt and acknowledge God – his presence, love, and involvement love in the lives of all those I will encounter and my own current circumstances in the next 60 minutes. I need to set my cell phone to chime on the hour, say the Jesus Prayer ten times and dedicate myself anew to the transforming work of the Holy Spirit by reciting the Prayer of St. Dimitri. Would a practice such as this be helpful to you? God grant me, a sinner, grace to keep this resolve. Today, May 25th, is the Feast of the third finding of the head of St. John the Baptist. The reading associated with it is Matthew 11:2-15. As has been mentioned a number of times on this site, my daily discipline of scripture reading corresponds with the Eastern Orthodox lectionary and my devotional aid in reading comes from “Dynamis,” which can easily be found on the internet. I highly recommend it. I never leave home without my old beat up maroon binder in my backpack or auto. “Matthew 11.7: “As [John’s disciples] departed, Jesus began to say to the multitudes concerning John: ‘What did you go out into the wilderness to see?’” Forgive the pun, but it is important to realize how spiritually ‘level-headed’ the all-famed Baptizer and cousin of Jesus was when, from prison, “…he sent two of his disciples and asked Him, ‘Are You the Coming One, or do we look for another?’” Be clear: Saint John was not seeking information concerning the Lord Jesus that he knew very well. He understood Jesus was the Messiah prophesied to come (Lk. chapter 1) and the Lamb of God that takes away the sin of the world (Jn. 1:6-8, 24-34). Frankly, John was continuing the ministry that God gave him: to bring everyone to repentance that all might gain salvation through the Lord Jesus (Mt. 3:11). The keen biblical expositor, Saint Jerome, understood this point very well. As he says, “…when John was about to be killed by Herod, he sent his disciples to Christ intending that when they met Him the disciples would observe His appearance and powers and believe in Him, and they would tell this to their teacher when he questioned them.” Saint John Chrysostom caps off the issue: “Jesus knew the mind of John who sent them, for He knew, as God knows, our inner thoughts. There He was actively healing the blind, lame, and many others. He healed not to teach John, who was already convinced, but those who had come to Him doubting. Having healed them the Lord Jesus said, ‘Go and tell John what you hear and see…’” (vs. 4). After John’s disciples departed, Christ our God Himself turns to the defense of the great Forerunner before the multitudes. He asks, “What did you go out into the wilderness to see? A reed shaken by the wind?” (vs. 7). Meditate on that line; its metaphor packs a punch. Who in his right mind would go into the wilderness merely to see a reed shaken by the wind? Along the Jordan watercourse probably there are thousands of reeds. We cannot speak about the winds in the Jordan Valley with meteorological knowledge, but given the valley’s depth and the heat generated over the Dead Sea, at times there must be good, strong winds that blow north up the river and whip the numerous reeds that grow along the banks. What is extraordinary about a reed shaken by the wind? “Absolutely nothing,” has to be the answer. The Lord’s question is an alert: He is disabusing any thought that there was vacillation or uncertainty in John the Baptist, facing his death. 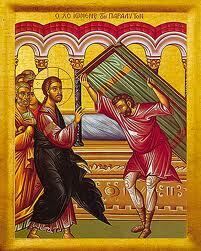 In Saint John’s disciples, there may have been a problem, but the Lord gave them evidence of stability (vss. 4-6). Christ shares His assessment: “Assuredly, I say to you, among those born of women there has not risen one greater than John the Baptist…” (vs. 11). Praise be to the Holy Spirit for his compassionate illumination of my mind!! All honor and glory to the Undivided Trinity – Father, Son, and Holy Spirit!! I was struck by the fact that Jesus does not say, “you will walk in the light” but, “have the light of life.” I believe there is something radical being said and offered by Christ Jesus – the Light which He is ! ! In Matthew’s gospel Jesus makes a similar statement about the quality of life that His disciples will enjoy when He says, “You are the light of the world.” (Matt. 5.14). Even the passage in which Jesus actually encourages His disciples to walk in the light, He makes it clear that they are to share the quality of walk that is His, “…if we walk in the light, as he is in the light, we have fellowship with one another…” (I Jo. 1.7). So, we are being invited to live a life in which we kind of “bask in the glow” of His life (light) but to actually become partakers of His life (light). This in the true nature of salvation and the transformation that occurs as we not only dwell in the Light but live as the Light by grace is partof our journey of salvation. As a matter of fact, Upward Call Ministries is founded on that bedrock theological conviction. The icon I chose for the informational pamphlets is “The Transfiguration”. A number of Christian writers: Cyril of Alexandria, St. Maximus the Confessor, St. Gregory the Great, John of Ruysbroeck, Jacob Boehme, Richard of St. Victor, and Martin Luther used the image of the iron plunged into fire, to describe how a disciple shares the life of God. Through Upward Call my desire is to share with you the invitation to understand salvation and the everyday Christian life sharing the life of God. There are a huge number of articles and books that treat the doctrine of theosis or deification. I include selections from a variety of sources, ancient and contemporary to help (pardon the pun) “flesh out” the doctrine and whet your appetite. As always, my prayer is that you will seek to find the place where this intersects your life in a practical way or follow the path toward an application that these quotes offer. I could not find the excerpt from Evelyn Underhill’s book that articulates the doctrine of Theosis online. So, I refer you to Mysticism, by Evelyn Underhill, E.P. Dutton, 1961, pg. 413-443 especially page 421. A wonderful little volume, available in downloadable form entitled, Theosis, the True Purpose of Human Life, by Archimandrite George is available here. “God on earth, God among us! No longer the God who gives His law amid flashes of lightning, to the sound of the trumpet on the smoking mountain, within the darkness of a terrifying storm, but the God who speaks gently and with kindness in a human body to His kindred. God in the flesh! It is no longer the God who acts only at particular instants, as in the prophets, but one who completely assumes our human nature and through His flesh, which is that of our race, lifts all humanity up to Him. How then, you will say, did the light come everywhere, through one sole person? In what manner is the Godhead in the flesh? Like fire in iron: Not by moving about, but by spreading itself. The fire, indeed, does not thrust itself toward the iron, but, remaining where it is, it distributes it own strength to it. In doing so, the fire is in no way diminishes, but it completely fills the iron to which it spreads. IN the same manner, God the Word who ‘dwelt among us’ did not go outside Himself; the Word which was ‘made flesh’ underwent no change; heaven was not deprived of him who controlled it and the earth received within itself Him who is in heaven. Look deeply into this mystery. God comes in the flesh in order to destroy the death concealed in flesh. IN the same way as remedies and medicines triumph over the factors of corruption when they are assimilated into the body, and in the same way as the darkness which reigns in a house is dispelled by the entry of light, so death, which held human nature in its power, was annihilated by the coming of the Godhead. In the same way as ice when in water, prevails over the liquid element as long as it is night, and darkness covers everything, but is dissolved when the sun comes up through the warmth of its rays: so death reigned till the coming of Christ; but when the saving grace of God appeared and the sun of justice rose, death was swallowed up in this victory, being unable to endure the dwelling of the true life among us. O the depth of the goodness of God and of His love for all of us! The gospel reading in both the Roman Catholic and Episcopal Eucharistic lectionaries is John 10:22-30. But, if I am really honest, I need to consider where the question, “How long are you going to keep us in suspense?” is present in my life. Honestly, I find myself asking that question quite often. Jesus has a tendency to “push my passion buttons” For example, my over active “need to know” and use of that knowledge as my source of security in the midst of difficult circumstances. Contrast that need with the invitation and challenge to do what He says and trust Him for the “results.” I am one of opponents and critics of Jesus when I demand (subtly of course) that He play according to MY rules of timing, results, approval, success, etc. What are the passions? They are those drives or needs, sin and death active within me that deny the Lordship of Christ and desire to keep me off track in my discipleship. They war against the work of the Holy Spirit. And, when I am living, asking, and seeking to hear the voice of God from the place of my passions, I don’t hear it. The passions are the opponents/critics of Jesus that roam around inside me asking questions of Jesus that sound like a desire to continue to acknowledge His Lordship but are, in reality, looking for ways to effectively deny His Lordship in how I live my everyday life. There is a sense in which my question, “How long are you going to keep us in suspense?” is really a question about the Lordship of Christ Jesus in my life. In other words, “If you are the Messiah, then act like one by telling me everything I BELIEVE I NEED to know in this circumstance.” I think that is exactly what I am doing – doubting His Lordship. IS He my Messiah/Lord when I am unwilling to obey/follow Him without “knowing everything” or, at least, the amount I THINK is reasonable for Him to tell me?? Today’s passage is about testifying to the Lordship of Jesus in those times when a greater degree of trust is required of me by the Lord God. The Holy Spirit makes no compromise or peace with the passions. His desire is to seek and destroy them, especially in the midst of difficult circumstances when my passions are most obviously active and the stakes are the highest in my life and the life of others. The urge to ask Jesus, in the heat of the difficult circumstance, ‘How long are you going to keep us in suspense? If you are the Messiah, tell us plainly.” (and, I would add, from John 6.30, “… what sign do you do, that (I) may see, and believe you? What work do you perform?”) betrays a need, on my part to repent. It is an opportunity to turn my self-centered question into a true yearning for the Lord to powerfully act in whatever way is suitable to accomplish His purposes, so I might rejoice in the revelation of His glory. The Sunday of the Paralytic… Human paralysis, the mystery of suffering and the redemptive purposes of God, human excuses, a legitimate desire for healing, delusional confusion of means and ends, learning from our past sin, and Divine provision. They are all there!! Wow, all in one story/event. When taken together, these four communicate; I believe, the profound invitation, challenge and promise offered to us by the Holy Spirit on the Sunday of the Paralytic. Here they are for, I pray, your edification. “The Cave When David told God, ‘You are my only place of refuge’, he’d no way of knowing there was a crown in his future, or that he wasn’t going to die in hiding. For all he knew, the cave he was in right then might be as good as it would get. When you’re in a situation you can’t fix, can’t heal and can’t escape, you have to learn to trust God. That’s not easy because it means becoming so immersed in God’s Word, so convinced of His goodness, so submitted to His lordship, that wherever you are is fine – as long as He’s here! Jesus knows all about caves; He suffered too. His life was in constant danger. He lost His position as a leader, His status as a teacher, and even His friends. Then things seemed to get worse; He went to a cross and died. With Him, the dreams He’d inspired in others seemed to die too. What started as a shining success appeared to end up a shameful failure. “Two Horses” Just up the road from my home is a field, with two horses in it. From a distance, each horse looks like and other horse. But if you get a closer look you will notice something quite interesting… One of the horses is blind. His owner has chosen not to have him put down, but has made him a safe and comfortable barn to live in. This alone is pretty amazing. But if you stand nearby and listen, you will hear the sound of a bell. It is coming from a smaller horse in the field. Attached to the horse’s halter is a small, copper-colored bell. It lets the blind friend know where the other horse is, so he can follow. Like the owners of these two horses, God does not throw us away just because we are not perfect. Or because we have problems or challenges. He watches over us and even brings others into our lives to help us when we are in need. ((The same Cathedral Bulletin includes the following invitation… The consistency is obvious)). Back to the Tomb. What or Who are You Seeking? What Do You Expect? Today is the 3rd Sunday of Pascha. We are moving away from the tomb toward the Ascension of Jesus and Pentecost ten days later. Any yet, the Church brings us back to the tomb. 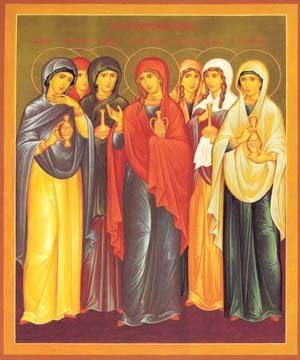 Listen to another account of the visit of the Myrrhbearning women to the tomb from St. Luke. I believe it seems best to the Church and the Holy Spirit to remind us, in the midst of our Pascha excitement, of the need to ask the question of “expectations.” What do you expect to find in the lives of others, in your job, in your children, in your spouse, in yourself? That expectation/conviction of the truth will govern what you seek and what you offer and what you can see. How easy we forget. How often we need to be reminded. We need to visit the tomb on a regular basis, not just once. Thanks be to God for His merciful reminder and challenge. Repent and believe the Gospel. Christ is risen! He goes before you in whatever you face. Serve Him in the place to which He has instructed you to go. He will meet you there!! I touched on, in my last post, “From Pascha to Pentecost – NEW LIFE Not Just A Second Chance,” the subject of trying in the Christian life. “Effort” is essential, but “trying” in the sense of attempting to do something on my own, alongside the Holy Spirit that is “mine” to please God or entice God to love me more is antithetical to the disciple’s life. “Trying” is the tragedy of me dressing up the corpse of the dead me and parading around pretending it is the new me. “Doing” that issues from a union of will and effort between my new self and God in which my effort is Spirit-breathed effort. “Trying” is living the “old way,” the dead way. “Doing,” as Morpheus says in the clip is the “new way,” the living Way. I would also encourage you to view the film clip from “Star Wars,” which can be found on the Vopod list on the right side bar of the blog. In that clip, Yoda says (in a rather frustrated tone) to Luke Skywalker, “Do or do not. There is no try.” Another cinematic way of saying the same thing. Implied in that question are a couple of presuppositions. First, the dissatisfaction with the conviction that the saving death and resurrection of Jesus is just about accomplishing the forgiveness of sins. Okay, so I am REALLY grateful that my past sins are forgiven and my sins in the future are forgiven. But, dare I say it? That is not enough! I am just the same old sinner racking up sins as I go along. Grateful but not changed. Second, if the death and resurrection of Jesus is about MORE than just forgiveness of sins, i.e. “eternal life” then to what degree is the rest of my life on this side of my physical death not just “waiting around” trying to “not sin” with no hope of ever succeeding until I am released from the torment of trying not to sin and never succeeding? Third, quite frankly, it is hard, “well nigh impossible,” to keep the Pascha flame burning inside me in the midst “this present darkness” that is all around me and very much inside me. The glow is inevitably fading. At least it feels inevitable. And, it will be inevitable unless there is more to the gospel that just: 1) right the scales of justice 2) a promise of something better out there somewhere. The proclamation of Pascha is that the risen Christ Jesus desires to bestow on all who come to Him NEW LIFE which includes the forgiveness of sin and eternal life. Let me share an excerpt from the reflection. And then comment on it to establish the gospel point. ‘…one must be ‘born again’ to ‘see the Kingdom of God.’ Nicodemos understood the Lord’s miracles or signs as a function of God being ‘with Him’ (vs. 2). ‘Rather,’ intervenes the Lord, “…the Kingdom of God is present, but is not seen nor perceived,” because those, like Nicodemos, who see only results or effects are not ‘born again.’ Because they are not spiritually regenerated, they do not see the Kingdom. Nicodemos completely fails to understand. The Lord then proceeds to deepen the topic of regeneration further, speaking of how one becomes spiritually regenerated. New birth is required by ‘water and the Spirit’ (vs. 5), by receiving what we have learned to call the Christian Mystery: Holy Baptism, Holy Chrismation, and Holy Communion. Subsequently, the Lord Jesus explains how it is that these Mysteries transform a person spiritually. Rebirth is an action of the Holy Spirit: ‘that which is born of the Spirit is spirit…” (vs. 6). It is beyond human manipulation or management. “So is everyone who is born of the Spirit” (vs. 8). Nicodemos is utterly baffled and perplexed (vs. 9). The Lord Jesus continues into the depths of spiritual regeneration: He Himself is the One by Whom men are reborn, and it is He Who teaches men how to receive the Mysteries of regeneration (vs. 11). These ‘earthly things’ by which men may find the ‘heavenly things’ must be learned from the One “Who came down from heaven, that is, from the Son of Man” (vss. 12-13). The Lord concludes this teaching with the life-giving message that Nicodemos and all men need: “…whoever believes in Him should not perish but have eternal life” (vs. 15). NEW LIFE is the point of the death and resurrection of Jesus. It is not just a motivational story to rev me up to “try harder” or to “make it all better” when I screw things up or a “pie in the sky by and by” promise to invigorate me to grit my teeth and tough it out until I am “raptured” by the Lord one way or another out of the miserable tribulation of living in a broken world that has no hope of getting better. The point of the death and resurrection is also not just about me. It is about what God is doing to and in the midst of the whole universe. It is about change. About new birth. About the new that replaces the old. Not just with regard to me. Not just regard to even us. It is about everything being new – all things!! A new heaven and a new earth. I new universe – invisible and visible – spiritual and material. NEW LIFE is a change. Opps, I said it. CHANGE… NEW LIFE requires change. But, it would be incorrect to just assume you know what is meant by the word “change.” It requires TOTAL change not just some “adjustments.” The death and resurrection of Jesus the Christ mandate my death and resurrection not just a methodology of moral or ethical improvement. Not just resolutions to “do better this time.” Not just adjustments. Not just starting over as the same “me” that I was before. Why? Because if I am just a “well adjusted me” I will find a way to become a “not well adjusted me.” There is really nothing in the gospel thus portrayed that offers me any hope of having things turn out the same this time as last time, if not worse. I must die and be reborn. The story of Nicodemus and Jesus joins the baptism of Jesus with the death and resurrection of Jesus. The events that serve to initiate and fulfill the ministry of Jesus are found in the encounter between Jesus and Nicodemus. The “would-be” and “long-standing” disciple of Christ Jesus must die and be raised with Christ Jesus. The epistle reading that goes along with the gospel reading, Acts 2:38-43, is perfect – “repent and be baptized” Peter says to the crowd on Pentecost when they ask, “What must we do?” It is what begins and fuels the ongoing Christian life. Without Pentecost, the Christian life is just one more “motivational” methodology or “self-help” formula. Without Pentecost, the death and resurrection of Christ Jesus is relegated to the “spectacular and powerful” event I admire but in which I have no investment or participation. That is blunt but true. I must participate or it is just an big “Divine drama” that fails to change humanity no matter how much it changes the rest of the created universe. If I do not enter into the baptismal waters and stay there by living a Eucharistic life then I am not part of the NEW LIFE in which the rest of the created universe is participating. In Holy Baptism and Holy Eucharist I offer my essential participation. Baptismal regeneration that results from the union of Divine initiative and my essential participation is, simply put, really dying to the old life and being born again – raised to new life not just “fixing up the old life in a major way.” The old life is not fixable. It must be discarded – die and be buried – completely. This is what baffles Nicodemus. He has (I have) been taught to “try harder” in so many different ways, all of which appear to be, and are to some degree, commendable. But, they are not the Christian life. They are a shadow. They fall short. They are not what Jesus is talking about with Nicodemus. That is why the story is, I believe, like so many other stories in which Jesus seems to be talking about something completely different than what the person has asked, jarring and upsetting. The disciples are talking about making the old better and Jesus is speaking about complete newness of life!! No wonder the stories seem so disjointed and nobody “gets it” – Nicodemus or us. So, where does all of this place me? It places me (and you) in the position of needing to ask “how?”… And that, brothers and sisters is the point of the fifty days between Pascha (compels us) to go. The Holy Spirit drives us – prods us (one of the connotations of the verb “comfort”) – toward Pentecost. Rebirth is an action of the Holy Spirit: ‘that which is born of the Spirit is spirit…” (vs. 6). It is beyond human manipulation or management. The point of the resurrection of Jesus is for me to do the same!! I am enabled by grace to be all that Jesus is by nature – resurrected. The resurrected life – NEW LIFE not just renovation or sin management – is the point of Pascha or there is no point to Pascha. The empty tomb points me to the Holy Mystery of Pentecost – baptism by water and the Holy Spirit and the ongoing fulfillment of that baptism by identifying with the Lord via His life-giving Body and Blood in the life of the fellowship of the Holy Spirit. Dying and being raised with Christ Jesus by the baptism of the Holy Spirit – water and fire – and the NEW LIFE that it brings – bread and wine – becomes REIGNING with Him. It is a Lamb who was slain and raised victorious that reigns at the right hand of the Father. Not one or the other. Both. The same is true for me. I must be, in the Holy Spirit, dying and being raised unceasingly in order to be REIGNING. Before I close, let me spiral back to the issue of forgiveness of sins and eternal life lest anyone go away with the misconception that I have trivialized their importance in the saving work of Christ Jesus. When placed in the context of NEW LIFE “forgiveness of sins” ceases to be the effective proclamation of a distant (albeit compassionate) judge in a courtroom and becomes relational reconciliation between three persons who yearn for a new union and the fruit that it will bear – God, me, and others. The meaning of “eternal life” changes as well. No longer is it a distant hope of being snatched out of the broken world. I am no longer consigned to living “in between” what I was and what I will become someday. The “future” and the “past” permeate the present by being taken, blessed, and filled with the new reality of the Kingdom of God. The past, present, and future are united in the Kingdom of God. The fullness of God’s saving actions are available to me now. They are not locked away in the past or the future. The fullness of all of God’s saving action is present in each and every saving action. The present becomes full of the life of Christ (the fullness of the saving action of the Father by the Holy Spirit) and therefore, abundant by being permeated with the Kingdom of God – with God’s love. Eternity ceases to be an indication of “when.” It becomes a quality statement. Eternity is a statement about the victory in which I am already fully a participant. Eternity is about becoming who I already am. Being and becoming. As I continue to surrender myself to the transformative power of the Holy Spirit, who is fully present in the midst of time – all moments – I grow up into the fullness of who I already am. My physical death ceases to be a “crossing over” moment from mortality to immortality. From “not-eternal” to “ever-more-fully-eternal.” Instead, death becomes one more (albeit more profound than perhaps any other) event that is used by the Lord to promote and deepen the quality of my participation in eternal life. I invite you to read the post-resurrection ministry of Jesus with all of this in your mind and heart. Notice how Jesus is pointing His disciples and apostles toward Pentecost. Notice how he is mentioning and beginning to establish in their minds and hearts the WAY of NEW LIFE in the Holy Spirit that will be initiated on Pentecost. Christ has died and Christ is risen to be our NEW LIFE by the regenerating power of the Holy Spirit in the Mystery of Pentecost in which we die and are raised with Him and in Him.